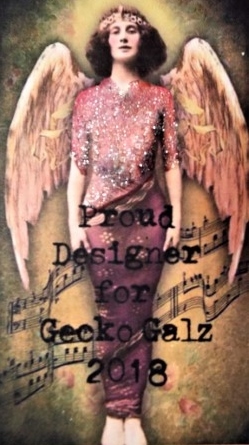 I am super happy to announce I will be working on the 2018 Gecko Galz Design Team! I have been using Gecko Glaz designs for years and am very happy to showcase these high-quality digitals in my art and on my blog . Beautiful high-quality designs at terrific prices, paired with Paper Temptress Papers and The Best Glue Ever, along with your creativity and you will have stunning paper art in your favorite style! I'm excited to be highlighting, Cards, Journals, Books ATC's and Tags! Wow, 2 new Design Teams in 2 days! Look at you go! Both teams are so lucky to have your brilliant creativity and talent. How in the world you get it all done ~ and do it all well! Great work Ginny! Well done Ginny - congratulations. I am looking forward to seeing your creativity with their graphics. thanks for the freebie too.